Now don’t get me wrong. I enjoy cooking and love planning and preparing meals but it occurred to me this morning how it really is a never-ending cycle. The citrus trees are producing prolifically at this time of the year so yesterday I juiced grapefruit, oranges and limes as well as preparing some grapefruit ready for marmalade. Today I am making marmalade using this recipe from Annabel Langbein. I am very happy with the result. Lovely colour and consistency. This is the excess that did not quite fit in the jar. The finished product ready to go in the pantry. It should be enough for the whole year. 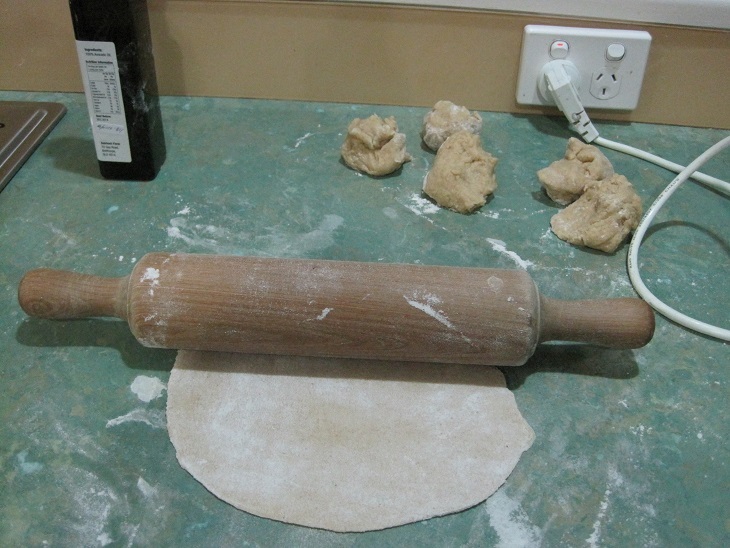 The other job is to make some more gluten free pizza bases for the freezer. The recipe I use makes 6 bases. On the other side of the ledger, I dived into the freezer and retrieved some vegetable curry for lunch. There are also portions of cooked rice frozen so lunch is ready to go. Dinner will be equally as easy with cauliflower soup and cheese scones all from the freezer. As an aside, all of this was prepared with zero waste and no single use plastics. It was nothing like ‘Tomato Day’ as described in the novel, “Looking for Alibrandi” but The Duke and I had our own mini version when we cut up 5.5kg of tomatoes yesterday. A couple of weeks ago I asked at the local fruit stall if they had any cooking/sauce tomatoes as I wanted to make tomato sauce. After some discussion it was agreed that they would try to get some from the market if there were any available and let me know. I had not heard anything so I asked again when we went yesterday to buy our weekly supply of fruit and vegetables. B then presented me with a box of assorted over-ripe tomatoes which had been sorted from the regular ones rather than specifically purchased. These were then given to me as they would otherwise have been thrown out. Back at home, we only had to discard 3 or 4 that were completely rotten and the rest were chopped up and placed in bags in the freezer. I simply do not have the time to make sauce this week in the lead-up to Christmas and holidays so they can stay in the freezer until I have time to make the sauce. This is an example of the benefits of eating seasonal produce and also supporting and getting to know your small, local retailer. I could not imagine this scenario happening at my local Coles or Woolworths supermarket. Some people in various parts of the world are living in economies that are officially described as being in a recession but wherever we live, these are definitely uncertain times. At the same time there is research showing that many 1st world nations waste up to 20% of all food purchased. That is the equivalent of bringing home 5 bags of groceries and throwing one bag of groceries straight into the bin. Perhaps it is time to look back to earlier generations and their ‘waste not, want not’ mentality. Everything was used, re-used and re-fashioned until not a single thing was left. This applied in equal measure to food, clothing, furniture and so on. Today I want to show you how we can easily make better use of the abundant food that we have. This morning I juiced a large carrot, 2 apples and about 1/3 of a pineapple. I drank the juice for breakfast and saved the pulp. Next was a 600 ml container of cream. This was bought in January and not required for a luncheon we were hosting so it was put in the freezer. Last weekend I thawed it to have some cream on dessert. 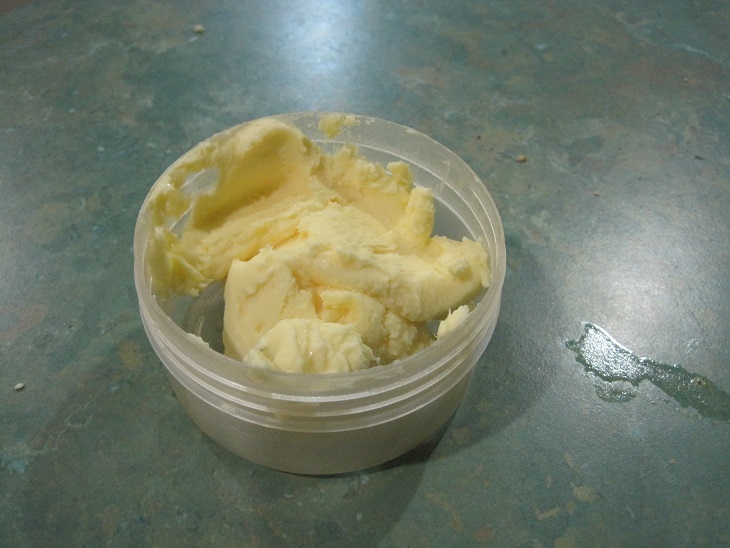 Only a small amount was used so today I put it in my Kitchen Aid stand mixer and made butter. I followed the description from here. I was very pleased with the result. I used 100g of the butter when I made pastry and this is what was left. From about 500ml of cream I made 220g of butter and had 250ml of buttermilk. I used the buttermilk tonight when I made a bacon and mushroom quiche for dinner. 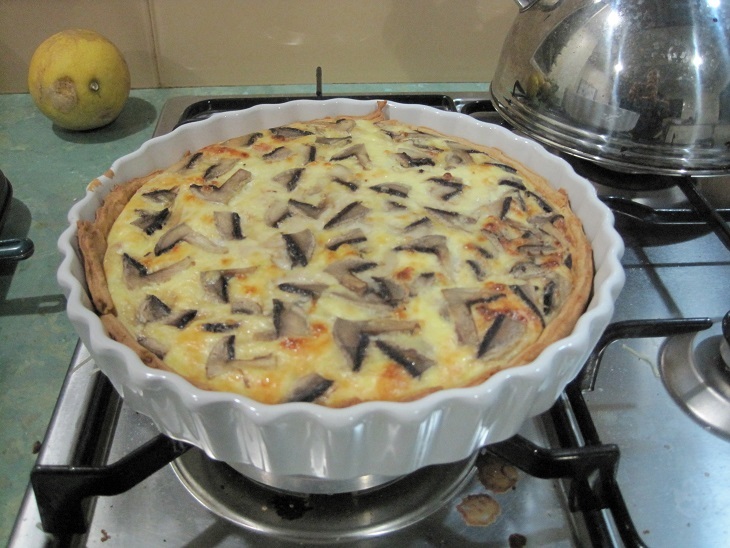 I mixed a couple of tablespoons of milk powder into the buttermilk to make a thicker liquid for the quiche. 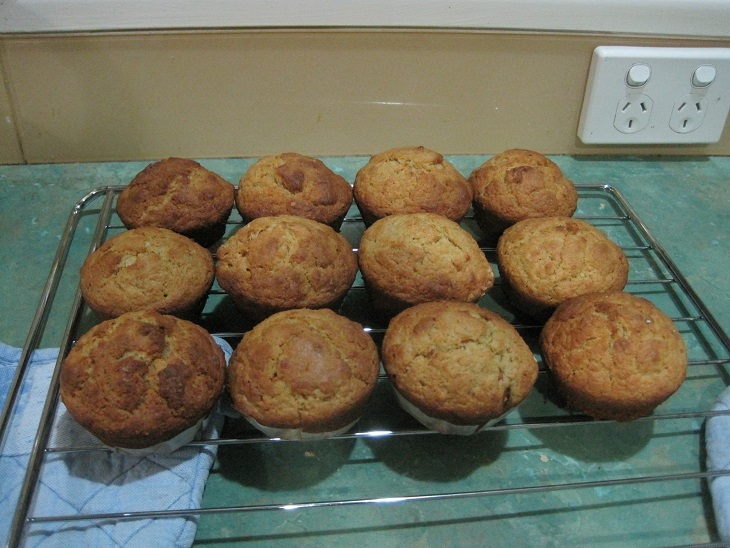 While the oven was on I also made a batch of muffins using the leftover fruit pulp from my juice. I made beef curry in the slowcooker from a recipe in one of the Sally Wise cookbooks. This is now divided into portions and frozen along with several serves of bolognaise sauce and a dish of lasagne. Making these meals is a reminder of how we can use our own condiments. The curry called for tomato sauce, worcestershire sauce, chutney and curry powder as some of the ingredients. I had home-made versions of all of these to use. Some of the pasta sauce I made during the summer when tomatoes were very cheap and plentiful went into the bolognaise sauce. 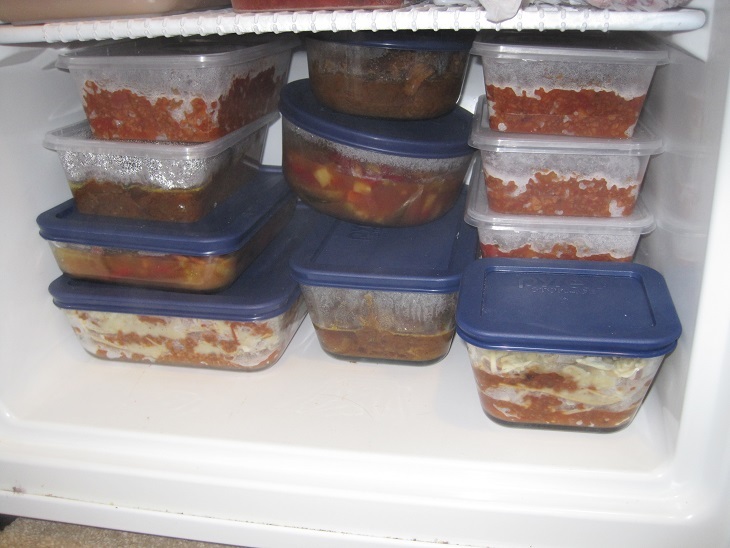 The lasagne sheets were ones I had made some weeks ago and frozen. It is great to have so many of the ingredients for meals at your fingertips and know that they have been created in your own kitchen and you know exactly what went into them. The Duke has made our bread from bought pre-mixes for a number of years and now he is experimenting with making it from scratch. 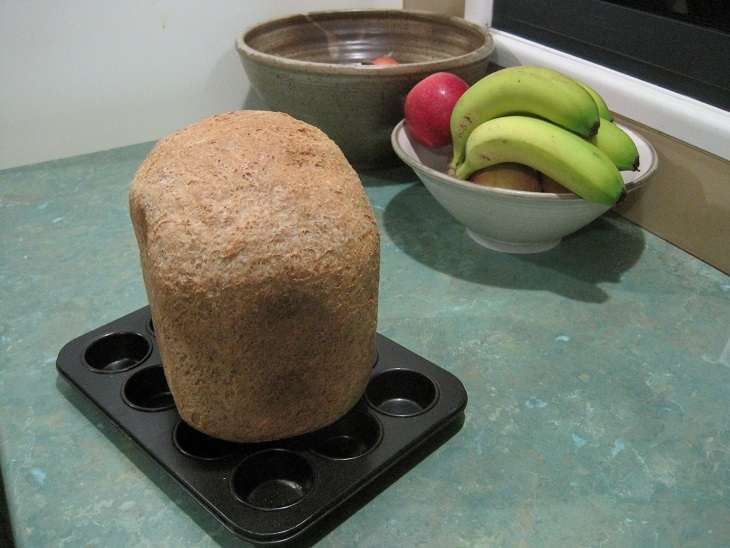 He has the white loaf pretty well perfect but has working on getting the wholemeal loaf the way he wants it. Here is the result of his effort today and naturally he is very pleased. Tomorrow I plan to make lemon butter which will use our own eggs and lemons as well as some of the butter I made today. How do you make the most of the food you have? Since I was at home today I took advantage of the extra time and made tortillas to use as pizza bases. I found the recipe on Simple Savings and it is very simple. Mix ingredients in food processer until combined. Knead dough for 5 minutes then leave to rest for 15 minutes. Divide into about 10 pieces and roll out thinly. 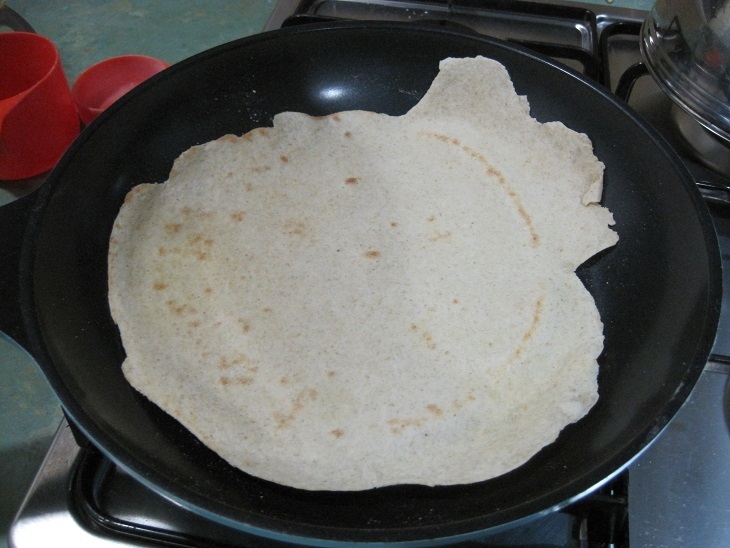 Cook in a hot pan and set aside when cooked. Keep covered with a damp teatowel. Here they are ready to use for pizza bases. I was happy with the result and the pizzas were a success. Unfortunately we were too busy preparing and eating the pizzas to stop and take photos. Maybe another day I will remember. 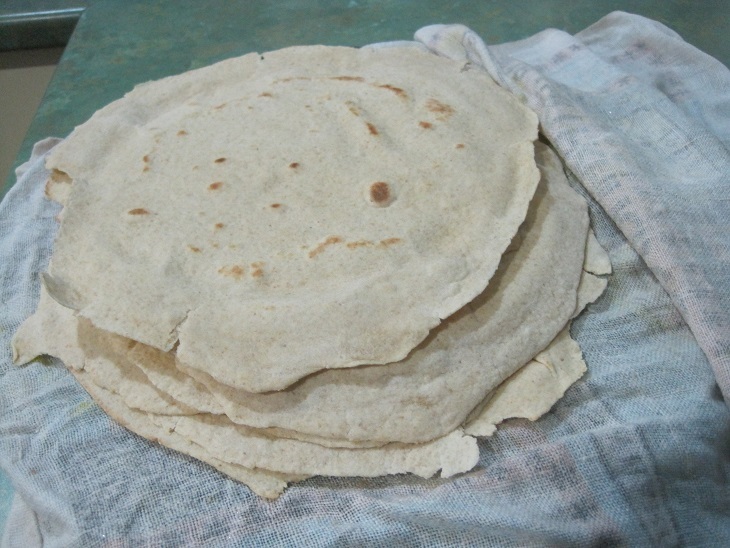 We used 2 tortillas and the rest are in the freezer for another time. I mentioned yesterday that ‘Friday Favourites’ will only appear when there is something really special that I want to share. This is one such recipe. 1 quantity of sweet pastry. 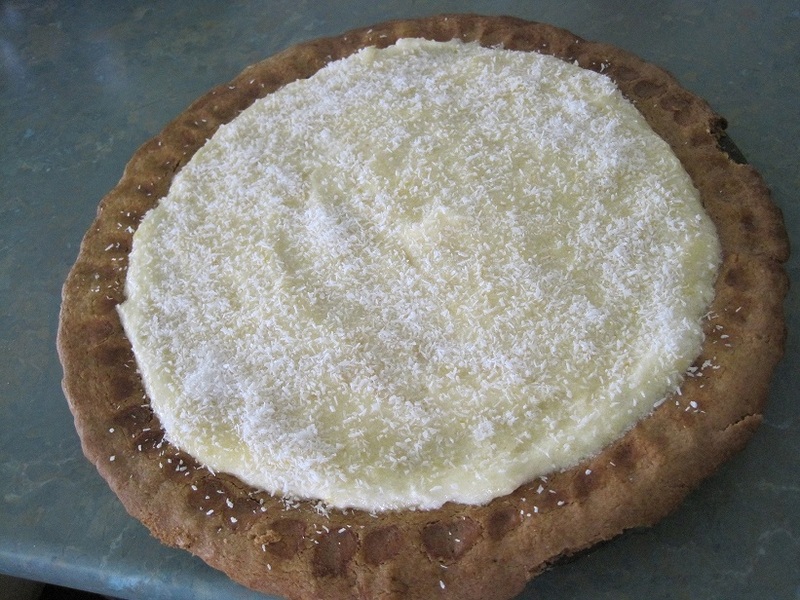 See this previous post about making pastry, the sweet pastry recipe is towards the bottom of the page. Separate the eggs. Beat the egg yolks, water, juice and ring of the lemons. Place mixture in a saucepan with the sugar and flours. Blend carefully over a low heat until the mixture boils and thickens. Remove from the heat. Beat in the butter and allow to cool. Beat the egg whites until stiff and fold into the mixture. Spoon the mixture into the tart shell and sprinkle with coconut. Chill. Serve with ice-cream or cream. NOTES: You will have an egg white left from the pastry if you use my recipe so I usually add it to the other egg whites so I get a bit more to mix into the tart.